Sridhar Gundurao | Thasmai Automation Pvt. Ltd.
On the auspicious occasion of Diwali, Thasmai along with Projent are elated to announce the opening of our newest store in South Bangalore (Nagarbhavi) on the 14’th of November, kindly grace the occasion with your family and office staff and bless our new branch! 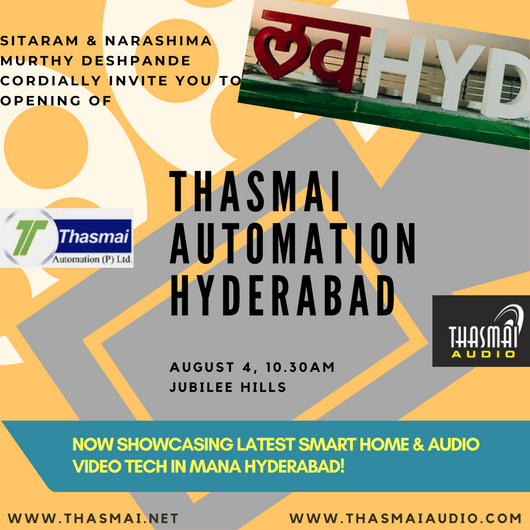 We will be displaying latest Home theater technologies with Dolby Atmos and Sonus Faber/Monitor Audio/harman line of speakers along with Denon & Marantz electronics. Check out all media on server/madbox right from Amazon prime, chromecast, netflix, playstation and many others. Check out the latest Alexa enabled smart homes with both wired and wireless automation technologies with brands like Crabtree and Hager! 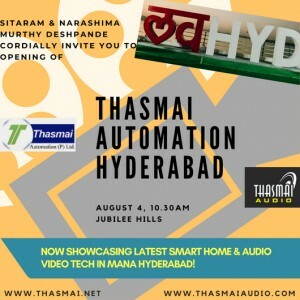 We take this opportunity to welcome you all to the Grand Opening of Thasmai Automation Pvt. 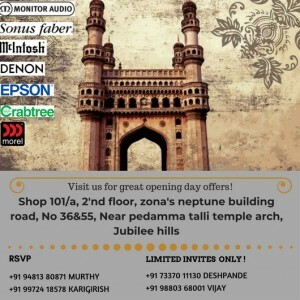 Ltd.s latest branch in Jubilee Hills, Hyderabad. The branch will have high end Automation, Smart Home and Theater demos displaying over 30 world class brands. Do visit us for the opening on the 4’th of August and grace the occasion with your presence. The Raspberry Pi is series of SBC (single board computer) which is designed primarily for educational purposes. Developed by the Raspberry Pi foundation in the US to promote the basic teaching of Computer science in schools. It is a small credit sized single board computer. It can be plugged into your TV and a keyboard that can be used for many of the functions that desktops perform like spread sheets, word-processing, games and it plays high definition video as well. Ultra low power of 1V. Credit card sized, fan less, instant start up. It can be called as Fun Computer, mainly used in schools for children to experiments, programming and robotics etc. It is inexpensive, simple, open and easy to maintain computers for schools. It provides fun environment for experimenting with programming and electronics. TECHNOLOGIES USED: The Raspberry Pi is based on Broad Com BCM 2835 system on a chip (SoC), which includes an ARM1176JZF-S 700 MHz processor and a video core 4 GPU. RAM was originally with 256 MB and later upgraded to 512 MB. It does not include built in hard disk, but uses an SD card for booting and long-term storage. Fedora- Unix like OS based on the Linux kernel and GNU programs. Etc.. PROGRAMMING : Python is used as default programming language. Any language which will compile ARMvC can be used with Raspberry Pi. INTERACTING WITH R-PI: For network access we need a network cables to connect to router. Keyboard and mouse can be connected through USB. We can connect Raspberry Pi to TV or other PC with HTMI cables. If TV or monitor has HTMI cable, it is easy that we can connect by HTMI cable and if a monitor or a TV has only DIV, then we need an HTMI-DIV cable or an adapter. To play audio or video, connect RCA out to speaker or display. Setting up the network is very simple and easy. It doesn’t have central controller and loads are distributed evenly across the network. It is easy to monitor and control home appliances from remote. It will take the place of existing infrared technology based devices. As ZigBee uses lithium battery which lasts long hence it will save cost of battery replacement. The Z-Wave network installation is simple and easy. If Z-Wave device is once installed, it is also easy to add/remove z-wave devices. The Z-Wave devices saves great amount of cost in the battery use as these devices consume less power. The home appliances are controlled remotely and this will add to great amount of comfort to the users. The z-wave technology based devices are cheaper and affordable. It requires knowledge of the system for the owner to operate ZigBee compliant devices. It is not secure like wi-fi based secured system. Replacement cost will be high when any problem occurs in ZigBee complaint home appliances. The coverage is limited and hence requires more z-wave devices to cover larger region. This increases the overall cost if more z-wave repeaters or routers are employed. The technology requires knowledge to keep it secure from unauthorized people. This is due to the fact that it is wireless in nature which can be accessed from anywhere and z-wave works on RF. It supports limited number of nodes i.e. 232 which is less than 6500nodes as supported by ZigBee standard. It supports less data communication speed up to 100 kbps which is less compare to ZigBee. Mesh networks become more suitable as you add more devices to the network. One Z-Wave network with 30 devices will tend to be more reliable than one Z-Wave network of 15 devices and one ZigBee network of 15 devices. If I had to choose one among ZigBee and Z-Wave, I would choose Z-Wave because I believe that for someone just staring home automation, putting together a highly reliable Z-Wave network will be easier than ZigBee. The Z-Wave Alliance has made it easy to find products that will plug into your network. Z-wave is wireless communication protocol used primarily for home automation. Z-Wave is mesh network topology. Z-wave automation can be controlled via internet from a wireless key fob, a wall mounted keypad or through smartphones, tablets or computers. Z-wave is considered as mesh topology. Mesh network covers greatest distance even around obstacles. This technology supports four hops between the controller and the destination device. A z-wave network is limited to 232 total devices. It operated at 908MHz frequency band. A z-wave signal can travel up to 330 feet between two nodes in an outdoor, unobstructed setting. However, it gets significantly reduce in the home. Walls and other obstructed combine with various sources of electrical interference to reduce the effective distance. A more accurate guideline for home installation is 100 feet for no obstruction and 50 feet with wall in between. Z-wave has more range hence it tends to be more reliable. Z-Wave is a proprietary technology. That means it is owned and maintained by a private organization. The Z-Wave technology is owned and licensed by Sigma Designs. It also runs the Z-Wave Alliance which controls the certification of all Z-Wave devices. The Z-Wave Alliance make sure that every Z-Wave device complies to strict set of standards. The Z-Wave certified controller will work with all Z-wave certified devices. Z-Wave certified products are produced by over 600 manufacture. Each one will be able to plug right into your existing Z-Wave network of devices. If the Door Locks, thermostat, lighting controls and security system are made by different manufactures and if they have Z-Wave inside, they are compatible with one another, it is as simple as that. Z-Wave devices not only communicate with the devices but also communicate with you. This series focuses on which wireless home automation platform may make more sense for your requirement. In part 1, we tackle Zigbee. ZODs: ZODs performs some tasks that includes keeping track of device roles, handles all the requests to join a network, device discovery and security. NETWORK LAYER: The network layer are used to make the correct use of the MAC sublayer and to provide a sufficient interface for use by the application. It performs with network functions like connecting, disconnecting, and setting up networks. It will also perform operations like add a network, allocate addresses, and add/remove certain devices. This layer uses star, mesh and tree topologies. APPLICATION LAYER: The highest-level layer is the application layer which provides the effective interface of the ZigBee system to its end users. It combines both ZDO and its management procedures, together with application objects defined by the manufacturer, are considered part of this layer. This layer binds tables, sends messages between bound devices, manages group addresses, reassembles packets and also transports data. It is responsible for providing service to ZigBee device profiles. ZigBee networks are not limited to any specific number of hops. A ZigBee network theoretically could have some 65K devices connected to it but it is possible to reach up 65K devices cause it would run into bandwidth problem. ZIGBEE INTEROPERABILITY: ZigBee technology is an open and original global wireless standard that is maintained by the ZigBee Alliance. A group of companies that support its development and its use is called as a ZigBee Alliance. The biggest strike of this is lack of interoperability due to confusion with the certification program. There are actually two levels of certification. One certifies hardware and software. It is possible that a product may get their hardware certification but not their software. Products like this might be labelled “ZigBee-ready”. A consumer may buy the product expecting it to work with all the other ZigBee products but it won’t. actually there are many interoperable ZigBee devices but it has got a bad reputation because of the loose of certification process. 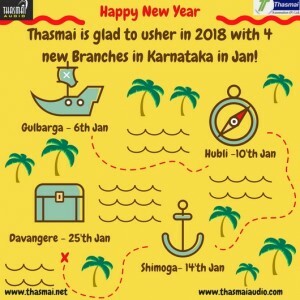 Thasmai wishes you and your loved ones a Happy New year and a great 2018. 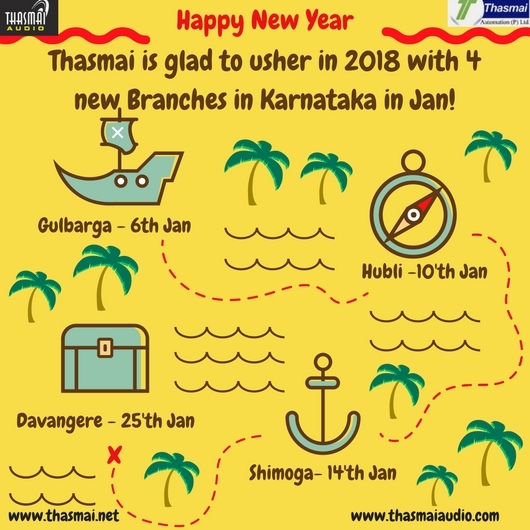 At our end, we’re happy to launch 2018 with a big bang, opening 4 new branches across Karnataka: Hubli, Gulbarga, Shimoga and Davangere. 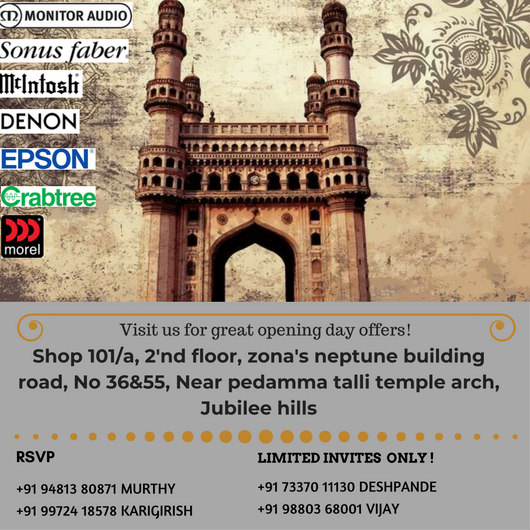 We’d love to solicit your presence in our new branches as esteemed VIP guests, for RSVPs please contact 8861644007/9972418578. All our new Home Theaters will display Infinity, Sonodyne, JBL and Revel Home theaters in addition to wired and wireless Home Automation setups. 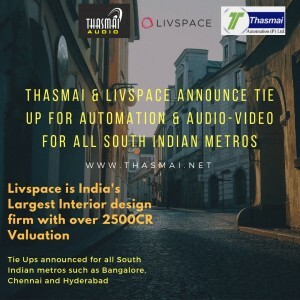 Thasmai opens a new Branch in Chennai! 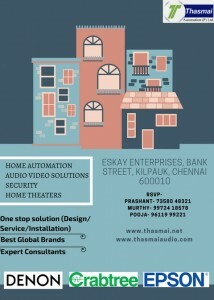 Get Smart home ready Chennai! Thasmai cordially invites you to the opening of our newest branch in the capital of Tamil Nadu, set in the heart of the city (Kilpauk), on the 25’th of November. Our new experience center will showcase the best of new Home Automation technologies available in the market, as well as multiple ranges of Home Theater solutions, including Hall Theater set up that can be integrated with your television, dedicated Theaters with Acoustical precision that blow away your mind! For any enquiries, please reach out to Prashant (73580 48321) or Murthy (9972418578), hope to see you soon in Namma Chennai!